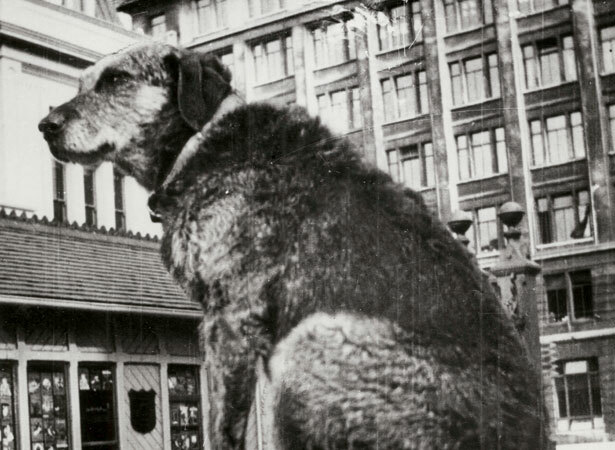 Paddy, a ginger and brown Airedale terrier, became a national celebrity because of his exploits on the Wellington waterfront (and beyond) during the 1930s. Paddy probably began life as Dash, the pet of a young girl whose father was a seaman. Dash spent a lot of time on the Wellington wharves when the family came to meet his ships. After the girl’s death in 1928, Paddy, as he became known, began to wander the wharves. Paddy soon became a much-loved local identity. Watersiders, Harbour Board workers, seamen and taxi drivers helped pay his annual dog licence. He became a familiar sight on Wellington’s trams and taxis, and journeyed by sea to New Zealand and Australian ports. In December 1935 he even took to the air in a Gypsy Moth biplane. As he aged, Paddy wandered less. When his health deteriorated, he slept in a shed on the wharves, where he received frequent visitors. When Paddy died, notices were placed in the local papers and a radio tribute was broadcast. A drinking fountain near the Queen’s Wharf gates commemorates his life. We have 8 biographies, 7 articles, related to Death of Paddy the Wanderer.